A regular occurrence on Parnell street. It’s a parking free for all there constantly. Nothing wrong with setting down on double yellows in this manner. DCC allows it for up to 30 mins if I remember correctly. 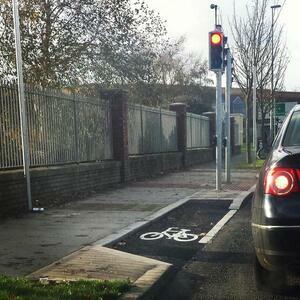 As for the cycle lane, cyclists can simply overtake like any other road user. Cycle lanes in operation are treated as clearways, so no they can’t be there. Of course this isn’t just bad for cyclists. Traffic on the left main lane will be slowed down by merging cyclists and indeed will have to slow down or move a lane right to get around the car anyway. The net result is that because someone didn’t want to spend an extra couple of minutes walking, hundreds of people will be delayed and have and increased likely-hood of crashing. TL:DR – Poo parking delays everyone, not just cyclist. Those damned ‘merging cyclists’ and their monopolising the roads ! Change “Merging” to “Migrant” there and you’ve got the Daily Mails dream headline. I heard the council lets you park up on double yellows for up to two hours with your hazards on. 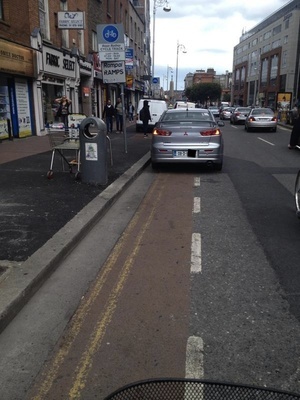 And that if you also block a cycle lane, you get a year’s free car tax. And half price coffee in Topaz. where did you get your driving license, a packet of Tayto? You’re close, but that actually only applies to single yellow lines. Cycle down the middle of the road. Remember, you’re the only one actually helping traffic. S.I. No. 332/2012 – Road Traffic (Traffic and Parking) (Amendment) (No. 2) Regulations 2012. Put an ambulance chaser on speed dial first ! Cycle lanes operate 24/7 unless a sign says otherwise. 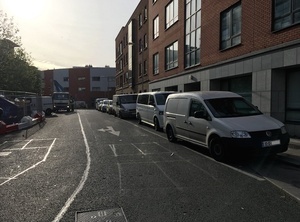 I can’t read the cycle track times on that sign but, if the cycle lane is not in operation and the cycle lane is marked with a broken line then you are allowed to actively load / unload in the lane for up to 30 minutes PROVIDED there are no double yellow lines. So the car in the picture is illegally parked. If there were no yellow lines and the cycle lane is not in operation and the line is broken then it’s ok for actively loading / unloading vehicles to sit there for 30 mins. If the lane is in operation then it’s illegal or if the lane is marked with solid line then it’s illegal. If you’re a punter just nipping in for a paper then it is also illegal. The sign says 01:00 – 19:00. Stopping on the road to take a photo is more dangerous and stupid….move along and get over it. Motorists may cross a broken white line when it is safe and necessary to do so for loading or unloading or setting down passengers or picking them up……..
You don’t have to stop to get the photo. small handlebar mounted cameras are becoming cheaper and and more popular. Also, the double yellow lines do have some significance here. You don’t get to ignore them just because of the broken white line. The double yellows stop just at his car so no double yellows. this post is just a waste of everyones time, they pull in to drop someone off get over it…..really isnt worth the space on here……. It says more about cyclists than anything else. One rule for them and none for them. She prob got off the bike and cycled up on the path for the rest of her journey and went through a few red lights too…..
Those double yellows could do with a lick of paint. Bolton street and the first part of Dorset Street are exactly the same and attract the same “hazard light so I can park where I want” gumbys. Free the city, country, world of bikes. Oh for a big roll of packing tape with “Bike lane do not park” and one of those roller things. Anyone want to start a business? Since returning from Berlin (a lovely city for cyclists) I have wanted to get a bunch of big stickers made up saying “i blocked the bike lane” or something similar and as I am on my commute into the city centre just slap them onto every offending car on double yellows. I have looked into this, and I could pick up 1,000 stickers for something like €60. Temptation is high! I see at least 2 offenders every morning and evening over a 9km cycle! That really would great. Honestly i’d buy a few off you if you did. Ban the bikes….a bunch of wasters. Id like to ride along on my motorcycle each morning with a 2×4 in one hand give the cyclists a nice wack on the back with it….just for being there…..oh the fun. very tempted, ive often tapped them on the back already, its great fun. clear the streets of cyclists…..!!! I’m more interested in the fabric shop! Anyone know if it’s any good?! Do cyclist ever do anything other than complain. 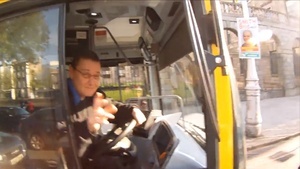 Let’s all send in pics of the cyclist’s who still seem to think a green man light means cyclists on the road can go, or ones who seem to just completely ignore red lights, or the ones who cycle along not even peddling and holding up traffic, or the ones who think a footpath is also a cycle lane. The list goes on and on and on……. And? Does that mean cars should be allowed to park in the bike lane? The transgressions cars make are much more dangerous to the public then bikes could ever make. And the transgressions cyclist make, as you listed above, are made with a much larger degree of view and with the ability to be able to hear more from the environment; so are usually much more reasonable for traffic flow then given credit (as much as they are against the law). A car breaking a red light can end more more easily in an accident than a bike ever could. you know the risks of cycling on the road, so if you donk like them then stay at home and keep all doors and windows locked. thats the best idea, less cyclists on the road, less hassle for everyone else…..